Washington, DC – (June 25, 2014) – Mobile translation innovator Muuzii today unveiled a game-changing mobile translation and language learning service for the North American market. 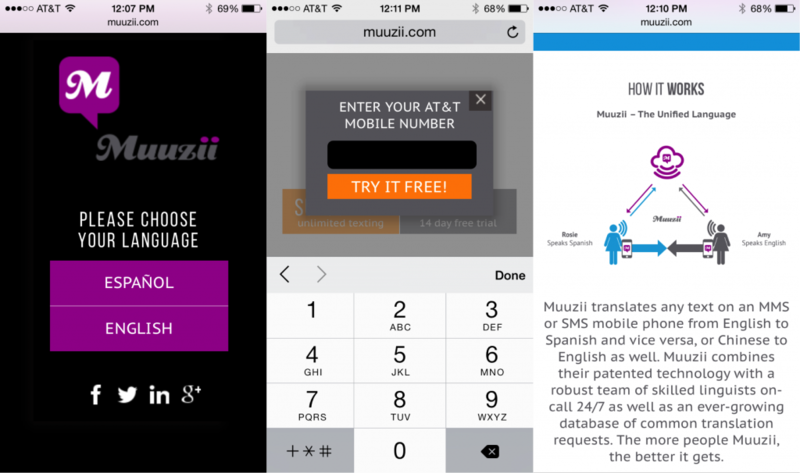 Piloted and tested by thousands of users in the U.S., Muuzii Message and Muuzii Speak are subscription-based language translation services accessed via any text-enabled mobile device. The groundbreaking service is the first to provide real-time, free-form and colloquial Spanish-English, English-Spanish and English-Chinese translations to North American users. To translate using Muuzii Message, a subscriber simply enters a phrase via text message, and an accurate text translation is instantly returned. With Muuzii Speak, the response includes an audio translation, enabling the subscriber to use and learn the correct pronunciation in a conversational context. Existing translation apps and web-based tools rely on canned phrases and dictionaries and by most estimates offer about 75% accuracy in their translations. Muuzii translations, on the other hand, are generated using sophisticated machine learning backed by expert human translators. The Muuzii translation engine “learns” new words, trending phrases and emerging jargon with every request, providing increasingly accurate and nuanced translations to Muuzii users. The system also scrubs and standardizes common language deviations, including misspellings, auto-correct errors and “texticon.” Novel requests to the system are diverted to expert human translators in real time to ensure accuracy. Muuzii is currently available by subscription on the AT&T wireless network and will expand to other North and South American carriers in the coming months. The company also expects to add new languages its portfolio quickly by replicating its dynamic language catalog. “Universal language translation isn’t futuristic – it’s already here, affordable and just a text away,” concludes Fang. Muuzii® is the innovative, mobile, language translation company that finally brings simplicity and ease of use to peoples’ needs and desires to communicate with others. The people behind Muuzii® are dedicated to the proposition that language should not be a barrier to becoming successful in business, education and everyday life.